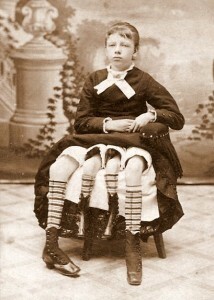 Myrtle Corbin, the Four-Legged Woman from Texas (May 12, 1868 – May 6, 1926), had a moniker that was slightly misleading. While at a glance one could plainly see four legs dangling beyond the hem of her dress, only one pair belonged to her. The other set belonged to her dipygus twin sister. The tiny body of her twin was only fully developed from the waist down and even then it was malformed – tiny and possessing only three toes on each foot. Myrtle was able to control the limbs of her sister but was unable to use them for walking and she herself had a difficult time getting around as she was born with a clubbed right foot. Technically, the ‘Four-Legged Woman’ only had one good, usable leg. She married a doctor, Clinton Bicknell, and eventually gave birth to four daughters and a son.